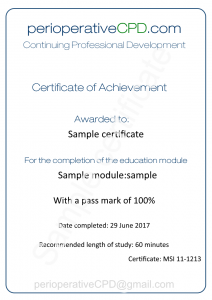 What do the certificates look like? Do I need to reflect on my learning? Copyright © perioperativeCPD 2015-2019. All modules and articles are for education and information purposes only. All modules are not intended to be used for clinical or medical decision making. * All modules are only for personal use, use by commercial or institutional bodies is permitted only with written permission.